White as light, the one, I'm about to post, is most probably, one of my best shots of my plants. The beauty of this is, for most people, until, I actually tell them what this flower is, aren't able to recognize this flower. The best part of this capture is the timing. The timing-the stage of the flower bloom, at which, the image was captured. 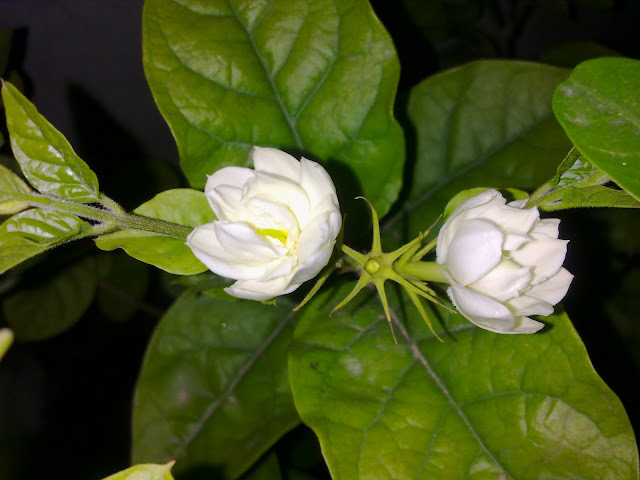 An image from one of my plants of a cultivar of Arabian Jasmine (Jasminum Sambac), locally known as chameli, mogra. The Arabian jasmine, probably, one of the most widely grown ornamental plant, here in India, is put to a variety of uses, including uses ranging from perfumery, incense sticks, etc. Apart from that, it's also widely used as an offering of the devotees to their deities, most prominently, in the southern parts of India. The other prominent use of the chameli is in making gajra (A garland mostly made out of buds of Jasmine or its varieties, due to its exotic fragrance and white colour). The gajra is used as an ornament, used to decorate a hairstyle, and used much prominently in the southern parts of India.